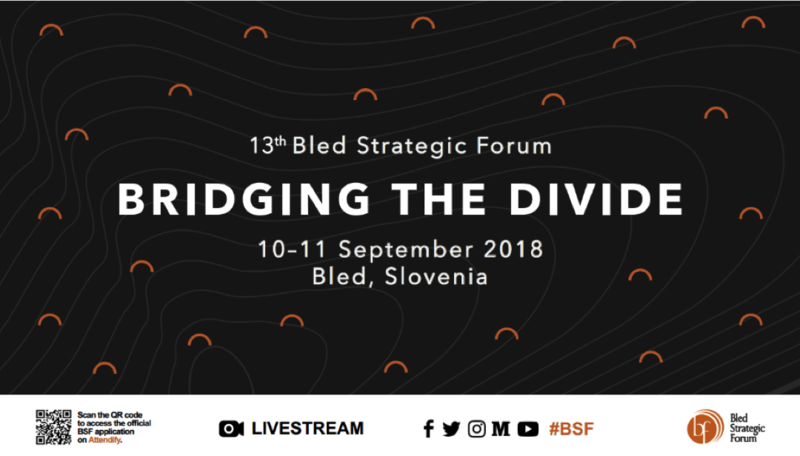 The 2018 edition of the Bled Strategic Forum will take place in Bled on 10 and 11 September under the title “Bridging the Divide” and will again attract over 1000 visible foreign and Slovenian guests from the spheres of politics, economy, research and development, science and civil society. Through the focus on deepening the divisions in regional and international security, political, economic and social environment, the Forum confirms its role as one of the most important strategic meetings in Central and Southeastern Europe. Recent technological advances have helped to deepen our understanding of the world and, in certain areas, bring us closer together than ever, but the world remains rife with tensions. The predictions and hopes of many political thinkers at the end of the 20th century that the access to information would result in greater homogeneity have not materialised. While many believe that facts are objective, we are now learning that in human interactions, distinguishing between facts and perceptions is harder than it seems, realising that the reality is very personal, subject to our cultural experience, traditions and values. How do we distinguish a fact from a perception or a myth? How do we decide that what we see is true and not merely the result of subjective views? And when our realities differ, how do we bridge the divide? We have developed the instruments needed to engage in an effective, inclusive and transparent dialogue. The array of tools at our disposal is greater than ever before, but these new technologies are merely tools, and they are also being used to perpetuate our differences. We remain enveloped in our traditional perceptions and are better at judging each other than looking inwards and making improvements at home. When will we start searching for the things we have in common with the same eagerness, ensuring a prosperous and sustainable future for everyone? For the 13th year, the Bled Strategic Forum fosters open space for a debate on governance of our society in the local, national and international context, education for future generations, inclusion and participation in decision-making for all members of the society, and technological as well as business challenges of the future. The Forum consists of three key elements: political-security forum, business forum and youth forum. The latter will follow the core topic and support it with a series of discussions under the titles “Business BSF: Future of Work” and “Young BSF: Sustainable Security – the Role of Youth in Bridging the Divide”. Decision-making in politics and progressive, sustainable as well as green economy seem to be inseparable, since the two spheres correspond to each other in their key elements. For this reason, this year’s Forum hosts high-level guests from both spheres, including: Aleksander Čeferin, UEFA; Michel Barnier, the Commission’s Chief Negotiator for the negotiations with the United Kingdom; Carmelo Abela, Foreign Minister of Malta; Enver Hoxhaj, Deputy Prime Minister of Kosovo; Srđan Darmanović, Foreign Minister of Montenegro; Christian Ketels, The BCG Henderson Institute; Alf Rehn, University of Southern Denmark; Reva Goujon, Stratfor; Manuel Butler, Executive Director of World Tourism Organization; Oliver Spasovski, Minister of Internal Affairs of Macedonia; Samuel Žbogar, Head of the EU Delegation in Macedonia; Amre Moussa, former Secretary-General of the Arab League; Bassma Kodmani, member of the Syrian Negotiation Commission; Amal Jadou, Assistant Minister of Foreign Affairs of Palestine; George Ciamba, State Secretary of Romania; and Andrej Zhernovski, Deputy Foreign Minister of Macedonia. Business BSF will focus on the evolution of work and its impact on jobs, businesses and the society at large. Globalisation, technological progress and demographic change have a profound impact on work. While the future offers unparalleled opportunities, it also presents significant challenges. How will these changes affect workers, employers and the society? It is clear that the Forum exceeds regional boundaries both through wide geographic participation and the selection of topics. It is impossible to disregard global challenges, such as the future of Europe, economic and political outlook and the current geopolitical balance between the powers, which will be in the centre on the first day of the Forum. On the second day, the focus will be on the mediation in the multipolar world, global agenda for sustainable development, climate security, technological advances and the new reality in the labour market, cyber security, artificial intelligence, gender equality, cultural cooperation through tourism, as well as resilient and inclusive institutions. Among the key experts and leaders from these fields are: Ohood Khalfan Al Roumi, Minister for Happiness and Wellbeing of the United Arab Emirates; Violeta Bulc, European Commissioner for Transport; Fatou Bensouda, Chief Prosecutor at the International Criminal Court; Fawaz Farooqui, Lead of the National Transformation Program 2020 of Saudi Arabia; Janez Potočnik, International Panel on Resources; Corneliu Bjola, University of Oxford; David Gorman, Centre for Humanitarian Dialogue; Antonio Missiroli, NATO; Colette Mazzucelli, New York University; Hussain bin Ibrahim Al Hammadi, Minister of Education of United Arab Emirates; Marko Grobelnik, AI Eesearcher at the Jožef Stefan Institute; Marcos Bonturi, OECD; Florian Bieber, University of Graz; Charlotte Ruhe, EBRD; Adil Najam, Boston University; Nikolaos Dimitriadis, Trizma Neuro; William Entriken, 0xcert; Patrick Cowden, Beyond Leadership; and Thomas Killion, Chief Scientist at NATO. For the past 8 years, the Forum has been accompanied by its younger brother, Young BSF, a meeting of young leaders who seek innovative solutions through vivid discussions and address burning global challenges. Over 70 participants from 30 countries will reconsider the concept of sustainable security and address the challenges of intergenerational cooperation, sustainable tourism, artificial intelligence, gender equality, security in the Western Balkans and the Mediterranean through 12 round tables and workshops. Special attention will be devoted to an inherent and urgently needed interregional cooperation that can lead to progress in democratisation, fight against corruption and terrorism, as well as adaptation and prevention of climate change. Strong interrelation between the topics of the BSF and Young BSF, which will take place from 7 to 9 September in Ljubljana, will for the first time in the history of the Forum result in discussions in Bled – namely, four young extraordinary leaders will participate as speakers in the main panels. The realisation of the Forum would not be possible without the support of the partners and sponsors. Among them are numerous institutional partners with whom we co-create expert side events and talks. The Ministry of Foreign Affairs and the Centre for European Perspective established partnerships with the AmCham Slovenia, Ministry of Economic Development and Technology, Slovenian Tourism Board, Global Diplomacy Lab, Government Office for Slovenians Abroad, Government Office for Protection of Classified Information, ITF – Enhancing Human Security, IISG – Integrative Security Governance, European Network of Political Foundations, European Fund for the Balkans, US Department of State, DUTB, Doshisha University from Japan, Faculty of Social Sciences, Embassy of Italy in Ljubljana, 51st MOS Celje and Centre of Energy Efficiency Solutions. At the same time, the Forum is created and developed with the support of sponsors, including the strategic partners Generali, Riko, Telekom Slovenije and The Boston Consulting Group. As a result of development, new partnerships and growth, the participation will meet last year’s records, including one third of participants from the civil society, one third from business and one third from the public sector.